During a recent day off from work I decided I had to finally visit the GPO Witness History Museum. A visit to the Pearse Museum pushed me to get myself together and finally go! No more waiting 4 years to go to museums or exhibits I want to see. That said, the GPO Witness History Museum opened in March 2016, so I am slightly behind, but it is a permanent installation! I stupidly think exhibits will be on for longer than they are, so I never rush to see them, no matter how much I may want to. This laid-back approach (a side-effect of living here too long!) is what caused me to miss Revolution 1916 in The Ambassador. By the time I decided I would go, the exhibit had been replaced. I am still kicking myself over that one but onwards and upwards to the number of exhibits, museums, and installations that Dublin has to offer. For starters, the museum is in the GPO, which is unique, and an appropriate memorial to 1916. The exhibition is focused on Modern Irish History which goes from the Cultural Revival through key events that shaped Ireland today. Safe to say, this exhibition was made for me! And any other Modern Irish History lovers. You can buy tickets online before you visit, or tickets can be purchased in the museum. The GPO is still a functioning post office today so make sure you head to the far right of the building to get to the museum. When you purchase your ticket, you will also be given a Visitor Plan which has the floor plan and a guide to navigate the exhibition. The exhibition is broken into four areas – The Lead in to The Rising, The Rising, The Aftermath, and the Commemoration Gallery. The exhibition is laid out so that you will naturally follow the progression of the breakdown of the areas. I would recommend not skipping any parts, especially ‘The Lead in to The Rising’ where the Cultural Revival, the social backdrop, and European context are explored. If you do not have this foundation to start, other bits in the exhibition will not make as much sense. If you read my post on Patrick Pearse you will already know a bit about his role not only in 1916, but in the Cultural Revival as well. I was extremely impressed by the interactive bits of the museum. There are several touch-screen panels that allow you to further explore artefacts on display. Typically, I find when museums try to weave interactive elements with historical artefacts, it just doesn’t go well but that is not the case at the GPO Witness History Museum. The touch-screen panels also display interactive graphs which truly demonstrate the effect the Rising had on the city. The display on children causalities of the week with their names and ages presented was one of the most powerful. Hands down my favourite part of the exhibition was the film, Fire and Steel. This 17-minute film depicts Easter Week from the perspective of those who were in the GPO, the Rebels HQ, and Dublin Castle. Spoiler alert: I cried. Even though I know a lot about 1916/Irish history in general, I always find it hard to truly picture what any historical events must have been like while they were happening. There are photos that show Dublin after Easter Week 1916 but what was it actually like to be in Dublin during the week? This film made what I have read about and studied for so long finally come to some sort of life. I also full get that 17-minutes is a bit long but the film kept the interest of everyone in the ‘mini-theatre’ where it is shown. The exhibition also doesn’t just stop at 1916, the importance of the Easter Rising is explored in ‘The Aftermath’. Retribution, the Irish Civil War, the Anglo-Irish Treaty and even the reconstruction of the GPO is also acknowledged. I hate when you visit an exhibition on a specific topic but there is no context to what was happening that led to the certain topic/event, or any follow up on what occurred after. The GPO Witness History Museum gives enough information either side of the 1916 Easter Rising without losing the focus of Easter Week and the role the GPO during that time. 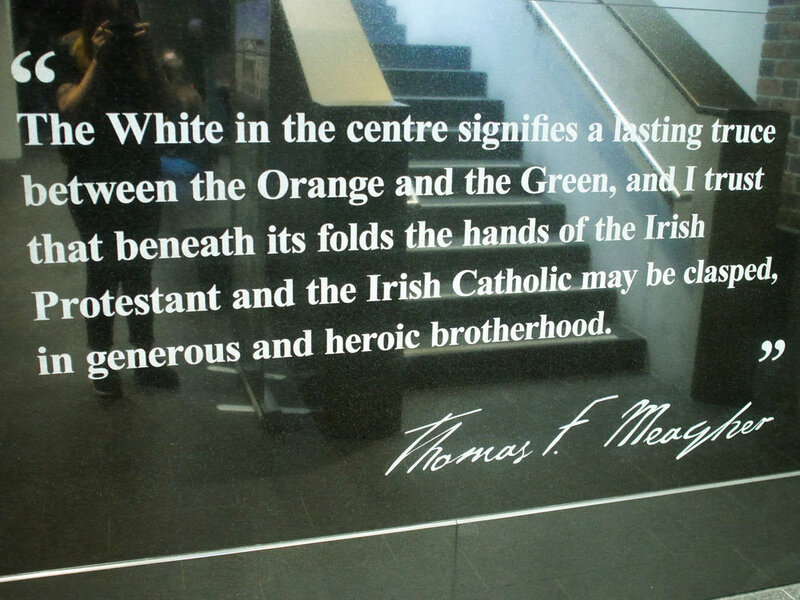 There is a new ‘exhibition’ at the end of ‘The Aftermath’, Thomas F. Meagher & The Irish Flag. I think calling this an exhibition is a bit of a stretch but that’s what the museum has it labelled as so I will call it that here. It is a brief, thrown on randomly bit at the end that appears out of nowhere. The main exhibition is in one massive room in the basement and Thomas F. Meagher & The Irish Flag is in almost hidden in a corner by the toilets when you walk out to exit the 1916 exhibition. Overall though, the best part of the entire museum was the fact that visitors unfamiliar could easily follow the history of 1916 with no prior knowledge. The exhibition is easy enough to follow if you had no prior knowledge on the subject but was still interesting for someone like myself who has extensively studied the event. If you like to include an educational aspect to your holidays or have an interest in Irish history, the GPO Witness History Museum is not to be missed! Looking for even more to do in Dublin? I got yah covered! If you want to say hello or have any questions about Dublin/Ireland, you can contact me here or send me a DM on Instagram. I love hearing from and being able to help y’all!